On Wednesday, March 6, I will be presenting to the Chino Valley Chamber of Commerce on How to Use LinkedIn to Generate New Business. I’d also like to give a special shout-out to Gigi Fix from Servpro Chino Chino Hills for being the breakfast sponsor for the presentation. 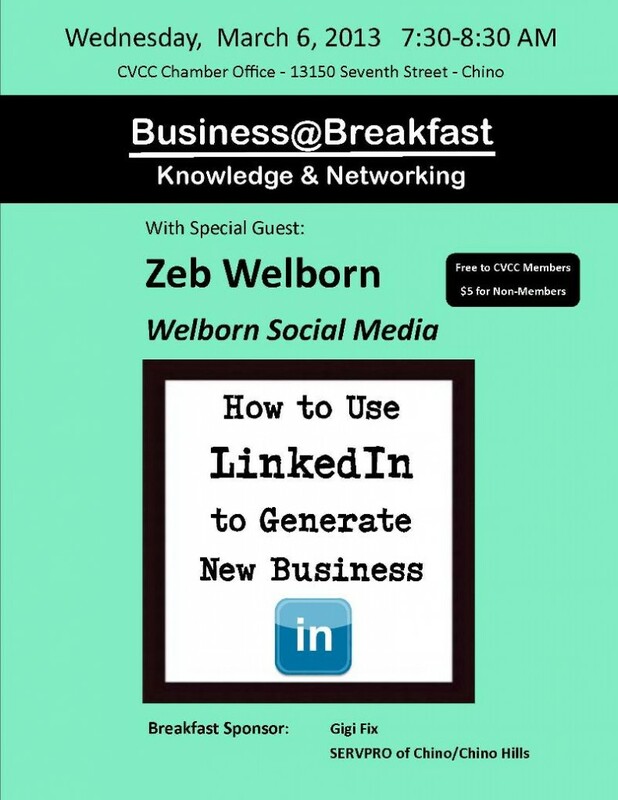 The presentation will be an in-depth analysis of How to Use LinkedIn to Generate New Business. We will discuss how to set up a LinkedIn profile. How to use your LinkedIn account to meet new people. And how to use LinkedIn to get more sales for your business and make more money. We love to educate others on how they can use Internet marketing and social media to grow their business. Please contact us at (909) 973 – 9089 or by email, Zeb@WelbornMedia.com if you’d like to have us present to your group/organization. Posted in LinkedIn, Presentations, Social Media Tips and tagged Chino, Chino Hills, Chino Valley Chamber of Commerce, Gigi Fix, How to Use LinkedIn to Generate New Business, LinkedIn, Servpro, Servpro Chino Chino Hills, Welborn Social Media, Zeb Welborn.